ThayerLife | Rejoicing in hope, patient in tribulation, constant in prayer. Rejoicing in hope, patient in tribulation, constant in prayer. Outside the PCICU at Vanderbilt there is a little doorbell that you ring to enter the unit. We rang the bell just before 10pm last night; the exact time the surgeon predicted Calvin might be settled in his room after surgery. The nurse informed us over the intercom that they were still getting him set up (balancing fluids, stabilizing his blood pressure, connecting him to all the machines). She asked us to come back in about 45 minutes. At 11pm we rang the bell again. Calvin still wasn’t ready. The doctor came out and explained he was doing well, but still having some pretty significant bleeding into his chest cavity. She talked with us for a while and told us to come back in about an hour and a half. At 12:30am we were finally admitted into the unit to see Calvin. Multiple nurses, a nurse practitioner, and two doctors were still busily weaving around the equipment in his room setting up IV meds, drawing lab work, and silencing various beeping machines. He was puffy and swollen with a mass of wires draping off both sides of the bed, but otherwise no worse than how we had seen him after his first surgery. The doctor pulled back his blanket to reveal one of his chest tubes which was still draining a significant amount of dark, thick blood over the edge of the bed into a containment box on the floor. We found out he had been experiencing significant bleeding in the OR as well. After closing his chest on the table they ended up having to open him right back up again to address bleeding issues. As the bleeding seemed to slow they closed him back up and sent him to the ICU. After settling in his room the bleeding had picked right back up again. The doctor informed us he had just called the surgeon again to come back to the hospital and “re-explore the issue.” What he meant by that was open Calvin’s chest for the third time to find the source of the bleeding. They sent us back out of the room to preform the procedure (the ICU rooms can also be turned into operating rooms so they didn’t move him). By 3am we were able to see him again and bleeding has thankfully not been a problem since. Today’s goals are to wean him from the breathing tube later in the day and to keep him comfortable while he heals. The staff is hopeful that his oxygen sats will continue to improve after the breathing tube is out. 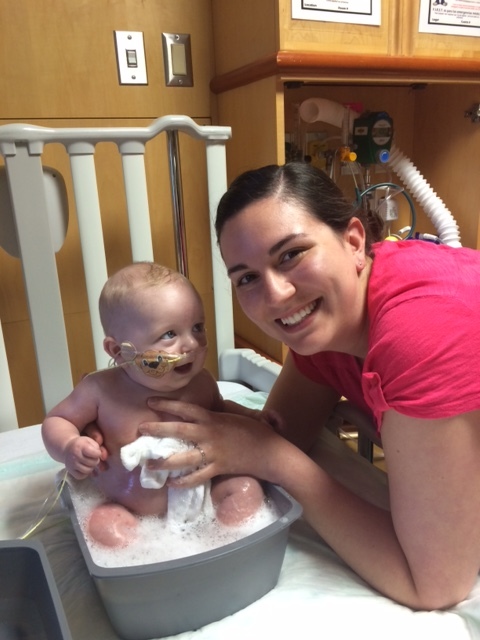 Please pray for improved oxygen sats, an easy vent wean, and a fast recovery for Calvin. There’s nothing like the bolt of adrenaline that comes from being awoken from a dead sleep by the phone ringing and reading the words “Vanderbilt Cardiology” on the caller ID. It’s happened 3 times for various reasons. All while Calvin was with one of his grandparents at the hospital and Tyler and I escaped for some much needed rest and supplies from home. We received one of these such calls a couple days ago to inform us that Calvin’s care had been elevated to the ICU after a particularly low and long desat (drop in oxygen level). Today we received the third such call from Calvin’s surgeon. He expressed that it would be in Calvin’s best interest to go ahead and move his surgery to tomorrow. One less day in the ICU means less risk of contracting a hospital infection or illness and less risk of him having another series of major desats. It’s a crazy time. I told Tyler after the call that the good news is we are hopefully coming to a close of all the chaos. One day closer to having him home. He responded in his typical fashion, “You think this is crazy? Just wait till we have 5 kids. This will seem like a breeze!” He told me that earlier this week he saw a mom walking through the busy Vanderbilt parking garage with her 6 kids. One toddler in a stroller, one chunky infant in a car seat carrier hanging on her forearm, and 4 other kids appearing to be all under the age of 10. He said all the kids were perfectly behaved as their mother blazed a path through the other pedestrians and (sometimes manic) drivers to their destination. Knowing that their parents likely work very hard to teach each of them the importance of obedience and that there have probably been many melt downs (and more to come) he said, “That’s where the crazy season is! And you can tell she was godly, too. No one else except a godly woman can lead children like that. You’ll be like that one day…we’re totally not there yet, but one day.” (We shoot pretty straight with honesty. I could not stop laughing). I hope that one day all this medical madness will have faded to the background and our biggest struggles will be how to handle toddler temper tantrums and raise godly children. Please pray for Calvin tomorrow afternoon as he goes in for stage 2 of his series of open heart surgeries. Pray there would be no complications, the surgery would go as planned, he would wean from the vent easily, and he wouldn’t have the debilitating headaches and fluid retention that typically come with recovery from this particular surgery. The best part of this surgery is that Calvin will no longer need the shunt which makes him far less “fragile.” For those of you who have experienced Calvin’s 15 pound girth in person, probably the last word you would use to describe him is fragile. He’s not sickly fragile, but his health has the potential to be…volatile. Any upper respiratory infection, like a common cold, has the potential to make it more difficult for blood to flow through the shunt into his lungs. If he gets too dehydrated, the shunt could start to narrow. The shunt is his life line right now. The only way his blood gets oxygen is through the shunt. This is why we have been keeping him on lock down for now. Also the statistic that 1 in 5 babies with his heart anatomy don’t make it to their first birthday – that one makes me throw up in my mouth a little every time I come across it. BUT many of those deaths are classified as “interstage mortality” ie between the shunt and the Glenn surgery. So, we are in a sense, reaching a milestone. By God’s grace we are through the most risky stage. If you made it this far, thank you for all your prayers, support, and love for our family! Well, it is painfully obvious that we failed this blog mission. Calvin is now three months old, and the last post was two months before his birthday….whoops? Calvin; Three Months and One Day New! 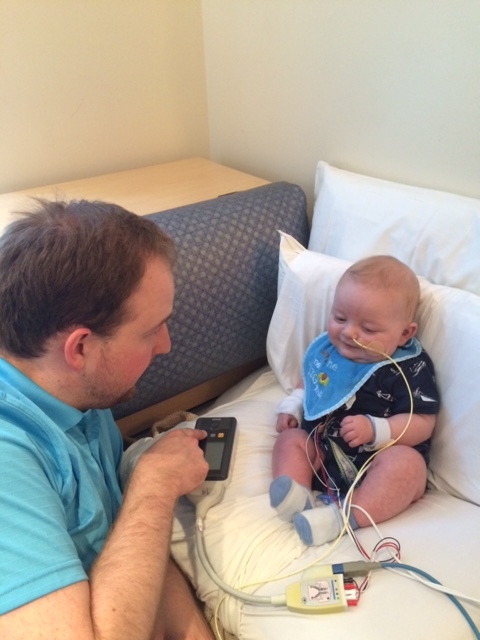 Calvin is getting stronger, smarter, more inquisitive, talkative, and happier every day. He is an amazing gift! I love this little dude from the the bottom of my heart. It is a really cool experience to become a father. The transformation from husband to husband and father is a really neat thing, indeed. Anyways, I want to update you all on Calvin’s hospital life….or as I like to call it, his long stay at Hotel de Vandy. Calvin was born on January 26, 2015 at 5:37pm (or 5:34pm, we are still trying to figure out which minute it really was). He was a 8lb-9oz bouncing, screaming, baby boy. Calvin in “the box” before his first surgery, the Norwood Procedure. When they put the pulse-ox on him, his oxygen levels were in the mid-90s. That worried the doctors a bit, since he was supposed to be the 70-80s for his heart condition. To help bring his oxygen levels down, they put him in “the box.” Long story short, his high oxygen levels meant that too much blood was going to his lungs, and not enough to his body…his flow was dangerously messed up. On February 2nd, Calvin went through the worst day of my life, his Norwood surgery. It was a successful surgery, and he was only in the PCICU for 4.5 days. His recovery was quick. The rest of our time was on “the cardiac floor” where children get off oxygen, learn to eat, and get ready to go home. Our stay was another five weeks; some babies can stay here for up to a year. That was a brief overview. We went home four times, going back tot he hospital for weekends or weeks in between. Yesterday, Friday May 1st, Calvin had been in the hospital for a week, and went through his first heart cath, a procedure where they go into his heart through a cath, and take continuous xrays to better understand the construction of the heart. They can also test the pressures of various areas of his heart and lungs. Calvin was cleared for his next surgery, the Glen, but it was recommended to wait another 4-6 weeks if possible, just so his veins and arteries can grow a little more. During his cath, they found a “little surprise.” Apparently, Calvin’s heart has a narrowed or mostly occluded coronary sinus. An issue that will need to be corrected during his Glenn, and unfortunately requiring him to go on the by-pass machine. We were stunned, shocked, saddened, but ultimately, it was always there, we just didn’t know it. As one of his doctors keeps reminding us. Every heart baby is different, not one of them has the same defects in the same order of magnitude or same accompanying complications. If we don’t look alike on the outside, how can we expect that all of our hearts are the same. The fact is, each baby’s heart is different, and the doctors must piece together each baby’s heart story to figure out the best way to treat and heal. There you go! You have all been roughly caught up. There are more details on our Facebook walls, so if you want to stalk Erica or I, go for it. 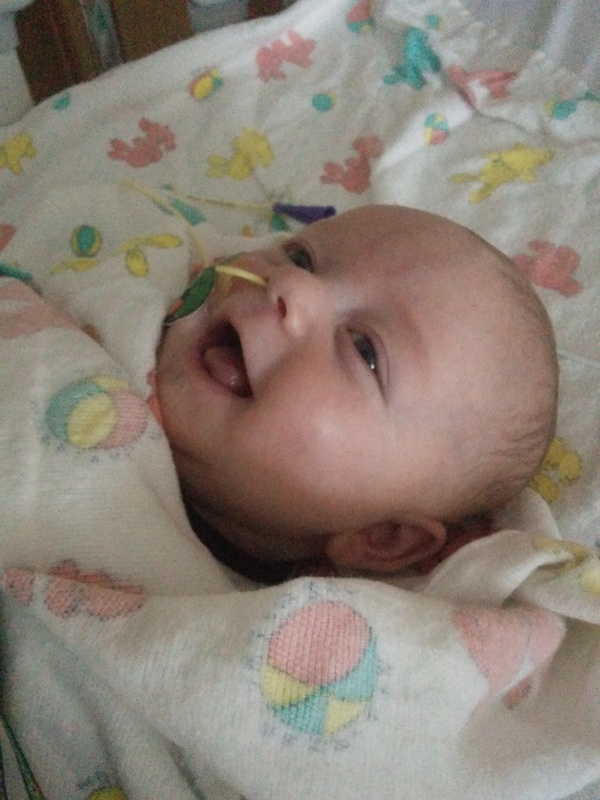 All in all, from his 20+ echos, 15+ xrays, one open heart surgery, and now his first heart cath, Calvin has racked up a long list of complicated and rare heart defects. As much as my heart aches that he will have to live life with these, I hope he sees God’s grace in it all some how. I hope he wears them with a sense of pride and hope. That God has for some reason saw him fit to bear these burdens for His Glory. 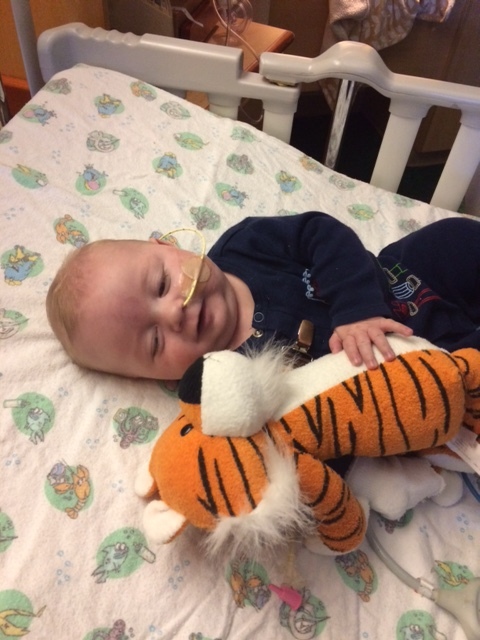 As of May 1, 2015, Calvin is known to have Tricuspid Atresia, Hypoplastic Right Ventricle, Complete Transposition of the Great Arteries, Hypoplastic Aortic Arch, VSD, ASD, Mild Mitral Valve Regurgitation, and Occlusion of the Coronary Sinus. Today we had an appointment with the OB at Vanderbilt. Everything checked out well and we have a big growing boy! Weighing in at 3lbs 5oz he’s still holding strong in the 92nd percentile at 28 weeks. The doctor then asked if I had received my glucose test at my regular OB – ha! I guess he really is a big boy 🙂 Fortunately, I do not have gestational diabetes and Calvin is not loaded up with sugar weight. Babies in the 92nd percentile typically weigh about 9 or so pounds at 39 weeks we found out. I’m happy to say that the plan is still to induce me at 39 weeks (thankfully we won’t be waiting on natural labor – I feel like if I actually went past my due date I’d start having anxiety that we would end up on the local news with a 12lb baby!). Currently Calvin’s birthday is all set for Monday, January 26th! Some of my fears about birthday were eased at this appointment as well. I kept picturing that due to Calvin’s heart condition the staff would whisk him away to the NICU right after his birth without us really getting to see him. The Neonatologist (Calvin’s future NICU pediatrician) told us that we would get to hold him for a quick minute and then they would take him to start an IV with his medication that he will need. They will put the IV in while in the birth room, monitor him for a bit to make sure he doesn’t have any adverse reaction to it, and then we will be able to hold him for a few more minutes. So much better than what I was picturing! After a few minutes they will have to take him to the NICU and the cardiology team will do their full eval, but we will be able to go see him as soon as I’m able. We are still praying that God would completely heal Calvin’s heart, specifically that his aorta would grow and not be so narrow. Also, we are praying that Calvin would tolerate the IV medication he needs shortly after birth well. 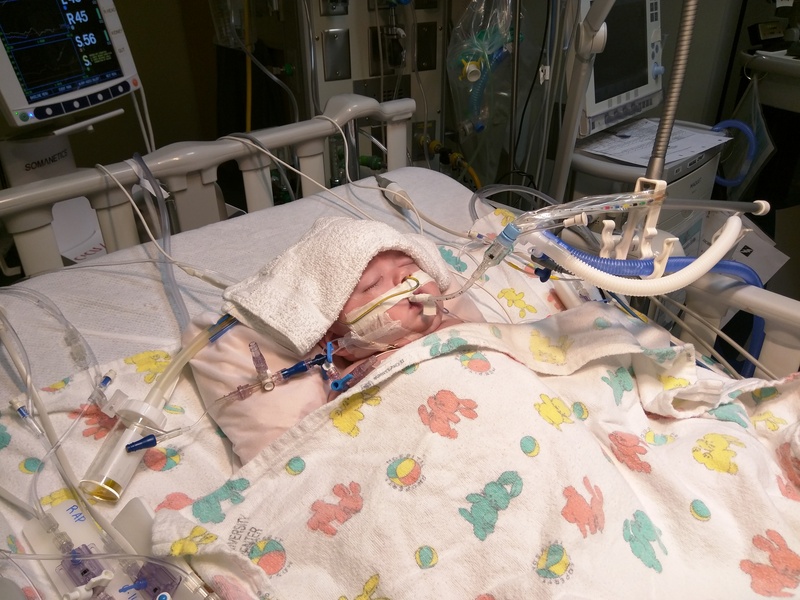 Some babies stop breathing on their own and have to be intubated until surgery. However, we are full of faith that God is sovereign over all, including Calvin. We are thankful for everyone’s continued prayers and support! 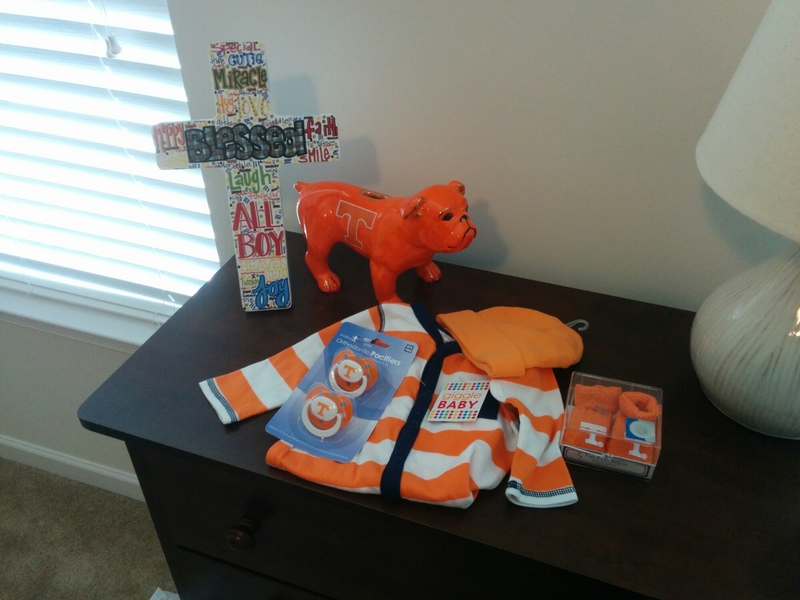 At our last appointment, we confirmed that Calvin’s blood runs orange…. Yesterday we met with Calvin’s pediatric cardiology team again at Vanderbilt for a follow up echocardiogram (ultrasound of his heart). His body is growing well and it was fun to get to watch him kick and turn in between recordings of his heart. After an hour of picture taking Dr. Parra sat us down and told us that although Calvin is happily bouncing around and growing bigger there is one part of his body that is not growing as expected: his aorta. The aorta is the large vessel that takes oxygen rich blood from the heart and distributes it to the rest of the body. In Calvin’s body this vessel is very narrow due to the fact that it attaches to the right side of his heart (the smaller side that does not received much blood flow – without adequate blood flow the aorta becomes narrow). At our last appointment 5 weeks ago Calvin’s aorta was small, but still on the lower end of within normal limits. We were very hopeful that his aorta would grow on pace with the rest of his heart. It was heartbreaking to find out that it is now measuring very small and will require a third open heart surgery. The surgery required to fix Calvin’s narrow aorta is called the Norwood Procedure. It is a complex open heart surgery that is performed approximately one week following birth. Our initial plan was that Calvin would spend about 5-7 days in the NICU after birth for monitoring and that we would be able to take him home. Then his first surgery would be between 3-6 months of age. 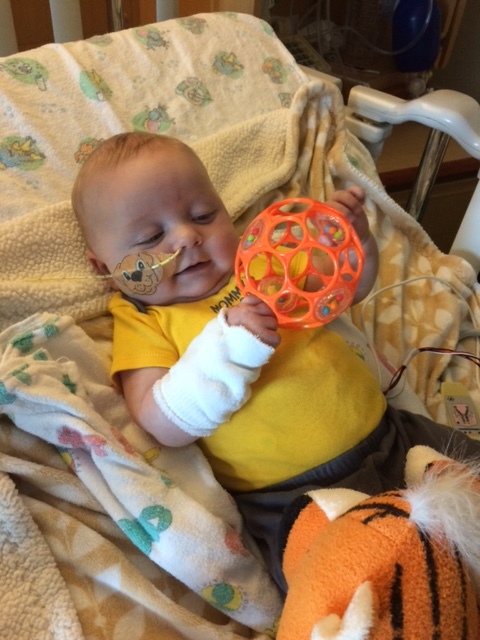 The doctors are now saying that Calvin will receive special IV medications for 5-7 days and then undergo surgery. The recovery time is anywhere between 4 weeks to 2 months in the Pediatric Cardiac Intensive Care Unit. As I’m sure you can imagine, the idea of our 1 week old baby undergoing open heart surgery was (and is) devastating to Tyler and I. We are still trying to wrap our minds around the whole idea. For me, to sum up my experiences in one word for the past 2 days would be WEARY. I am just downright tired and exhausted mentally, physically, and spiritually over the whole situation. We ask that you would continue to pray for Calvin and also pray that we would have increased strength and an ever-increasing faith in the goodness of God. We are firm in believing that God is the ultimate healer and that he has not left us to fend for ourselves in this situation or in any to come. We welcome your prayers, thoughts, and questions. Thank you to everyone for your support during this time! As most of you know, Erica is pregnant, and we are expecting a bouncing baby boy at the end of this January! Erica and I are truly excited, and cannot wait meet little Calvin Ray Thayer–so far all the ultra-sound pictures show that he is cuter than a button and most definitely takes after his mom. At our 20-week anatomy ultra-sound we found out that Calvin had something wrong with his heart. Our general OB referred us to a High-Risk OB, and the news only got more devastating. The high-risk OB had never seen such a complex heart defect and had no clue how to diagnose his condition, as such, we were referred to Vanderbilt Children’s Pediatric Cardiologists. At Vanderbilt we experienced a 2 1/2 hour ultrasound in which they studied Calvin’s heart very closely. At the culmination of our appointment, they diagnosed Calvin with Tricuspid Atresia and Transposition of the Great Arteries. As you can imagine from the name of it, it’s a pretty complex heart defect. The short version of the issue is that his heart effectually only has three chambers, instead of four. At the time of the ultrasound, his right ventricle was almost non-existent. The result is that his left ventricle has to work overtime. Also, with oxygenated blood coming from the lungs and un-oxygenated blood returning from the body both mixing in his heart’s one chamber, his blood-oxygen level will be lower than normal (about 70% instead of the normal 100%). Thankfully, the left ventricle is the body’s stronger of the two, so it should hold up well into his adult life. 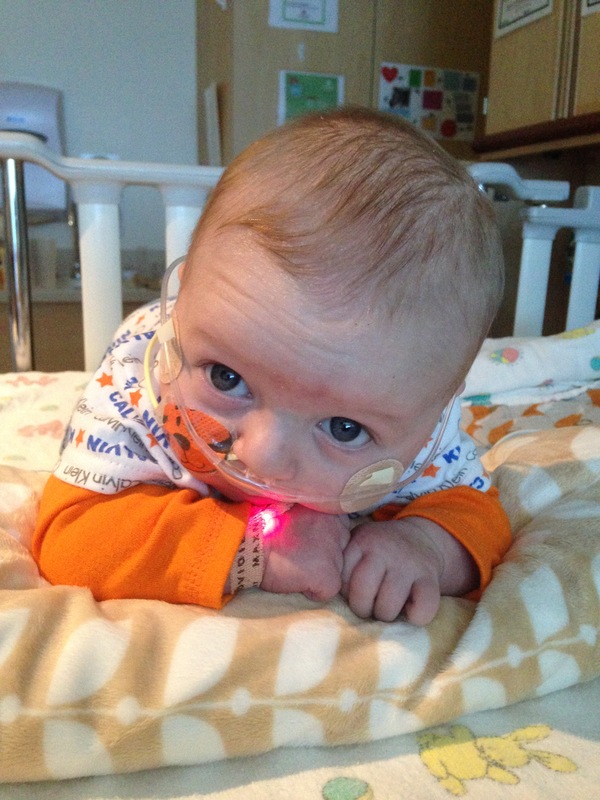 In addition, there are two open heart surgeries that are available for Calvin. By the end of which, he should have normal blood oxygenation. Upon hearing that, we finally received hope that God has provided doctors with a solution to a major defect. There are risks with the surgeries, but they are much improved over 40 years ago, when they began these procedures. Vanderbilt is even seeing two people with similar heart defects, one who is 21 years old and attending college, and another who is 36 and has a family. After hearing that, we were really encouraged. Nevertheless, we’d like to ask you for your prayers. Specifically, that God would give Calvin a new physical heart, much like he does when he saves us. We’re praying that his heart would grow strong and healthy–even though the doctors say that it can’t grow normally to fix itself. I believe that the growth of a baby in the womb is a miracle in and of itself, so in the next three months, I’m praying for another miracle. Jesus Christ, our risen Lord, has all authority over the fleshly realm, so I am convinced that he can heal Calvin. In addition, at our last cardiologist appointment, they noted that Calvin’s Aorta was smaller than his Pulmonary artery. It was still within a normal size range, but we are praying that his Aorta will grow perfectly. If it is small, it would require a third surgery. Lastly, please pray for myself, Erica, and our families. Naturally, it’s hitting all of us pretty hard. Please pray that our God would give us faith, and that we would all enjoy our Father’s steadfast love. We’re encouraged: Our Community Group has prayed for us on multiple occasions, and we have heard reports about churches all of the nation praying for Calvin. Please join with our petition to God. Thank you for your prayers and love.